Castles are teeming with history. In A Castle in England, Jamie Rhodes has taken the real-life history of Scotney Castle in Kent, England, and written stories that are windows into life in the castle since the 14th century. Jamie Rhodes spent around four months living on site as a writer in residence at the National Trust property. He researched the people who had lived there, spending time in the same rooms as they did, imagining their daily routine and experience of the changing times. Five stories have been chosen for this graphic novel. They cover five different time periods, across five different centuries, and each has its own family tree derived as much as possible from historical documents. By featuring different people in each story (a peasant, priest, smuggler, widow, and hunter), we see varied perspectives of lifestyles and history. Historical context notes are provided at the end of each story, which lend real weight to them. It's a creative and engaging way to discuss significant historical times and would offer a great opportunity to raise them in a classroom. We learn about 'The Peasant's Revolt' of 1381, the religious persecution of the English Reformation, and the 18th century smugglers who circumvented extreme taxes, among other events. 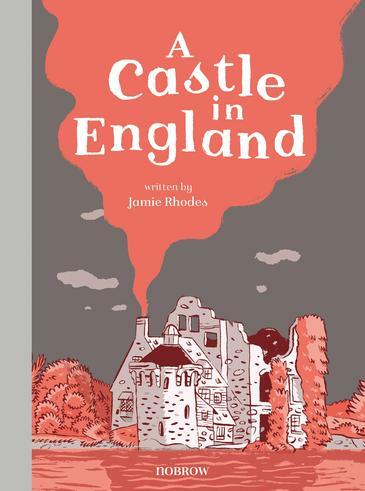 A Castle in England is a sturdy, quality hardcover book. Each story has been illustrated by a different artist, each with different styles. It's something that adds yet another layer to the lives and times of the residents of Scotney Castle. If you'd like to see the real Scotney Castle, click on the link to visit its official website and view photos of what looks like a real fairy-tale castle.